It’s here. Fire up the panini press. It’s National Grilled Cheese Sandwich Day (April 12). If you need an extra excuse to treat yourself to the comforting warmth of gooey melted cheese on buttery toasted bread, consider this the occasion! 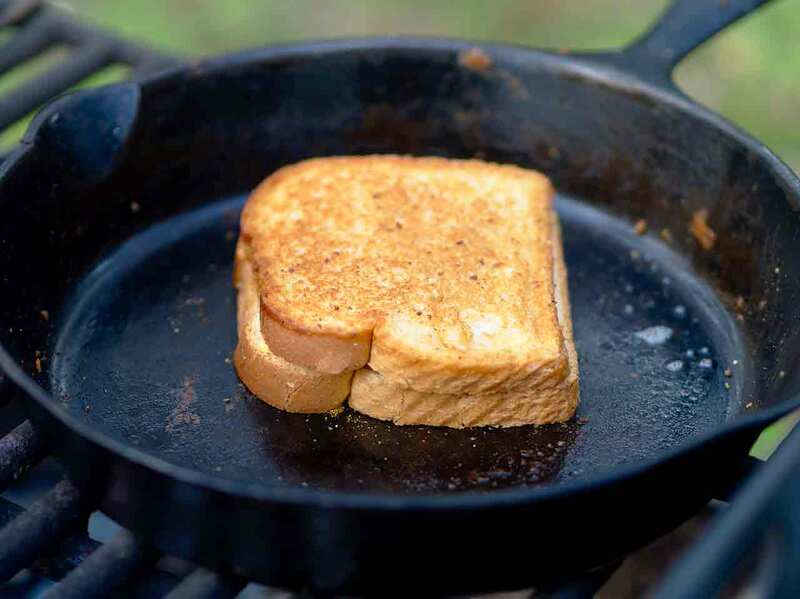 And since everything tastes a little better when cooked over an open fire and eaten outside, may we suggest lighting a campfire and enjoying a grilled cheese sandwich (or two) in the great outdoors? As simple and delicious as the classic grilled cheese sandwich is, variety is the spice of life. Spice up your sandwich with one of these new twists on an old standard, or get creative with whatever you happen to have lying around in the fridge or pantry. 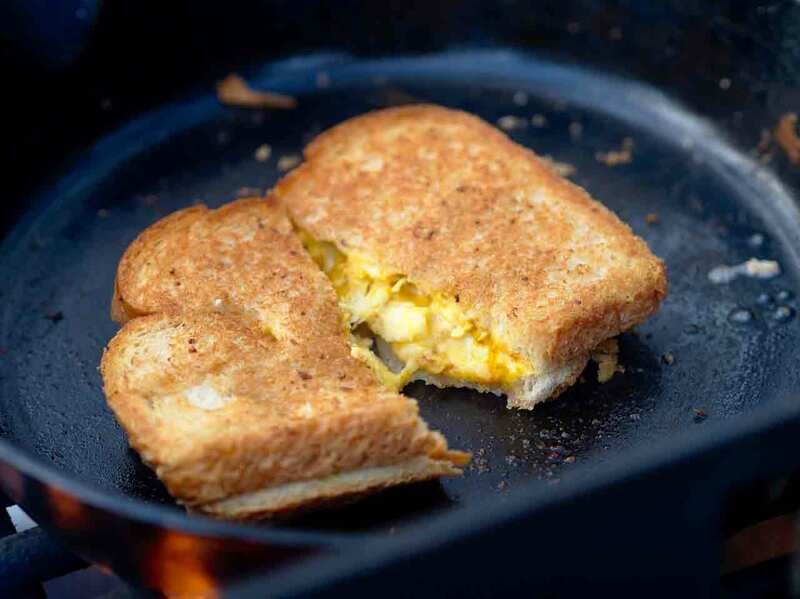 We recently spent a Friday evening experimenting with different grilled cheese variations, using only what we happened to have on hand in our RV. Our family gathered around the campfire and became very willing guinea pigs. We used both a cast iron skillet and a double pie iron to make our sandwiches. 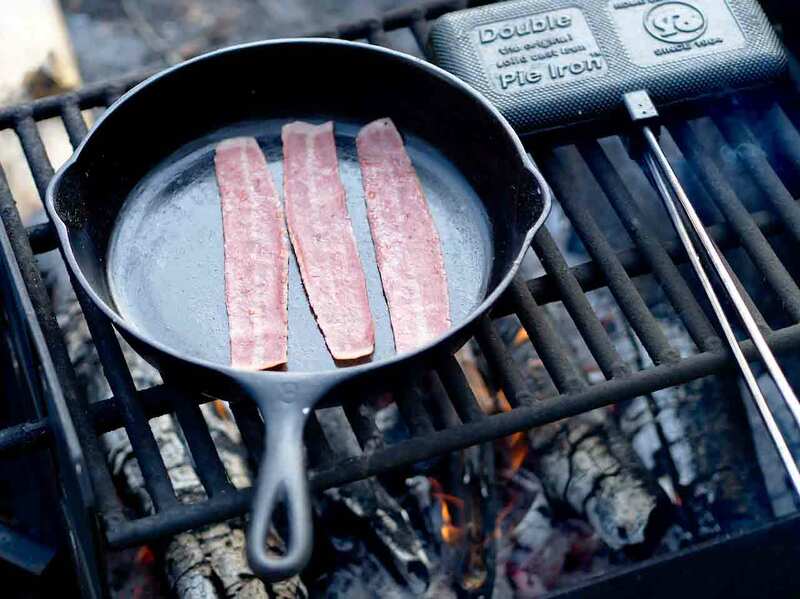 Fry up some bacon in your skillet (over the fire, of course!) then place it on your sandwich between two slices of cheese. 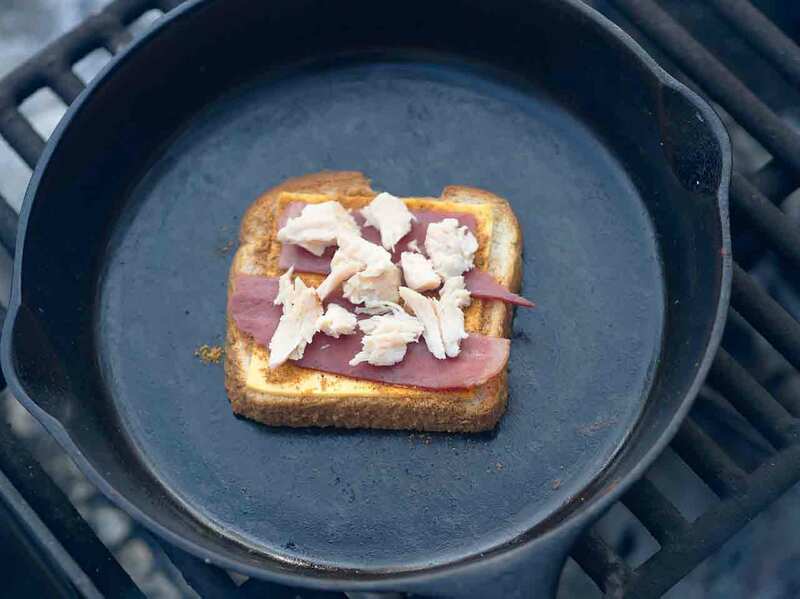 A little leftover bacon grease in the pan will soak into the bread as you toast your sandwich for an added flavor kick. Bacon ranch grilled cheese: Drizzle some Ranch dressing on your first slice of cheese before adding bacon. Added benefit: the dressing helps keep the bacon in place until the cheese starts to melt. Chicken bacon ranch grilled cheese: Same as above, but add some pre-cooked chicken to the mix. Finely chopped or shredded chicken works best. Bacon taco grilled cheese: Sprinkle your cheese and bacon combo with taco seasoning — delicious with or without some added chicken. 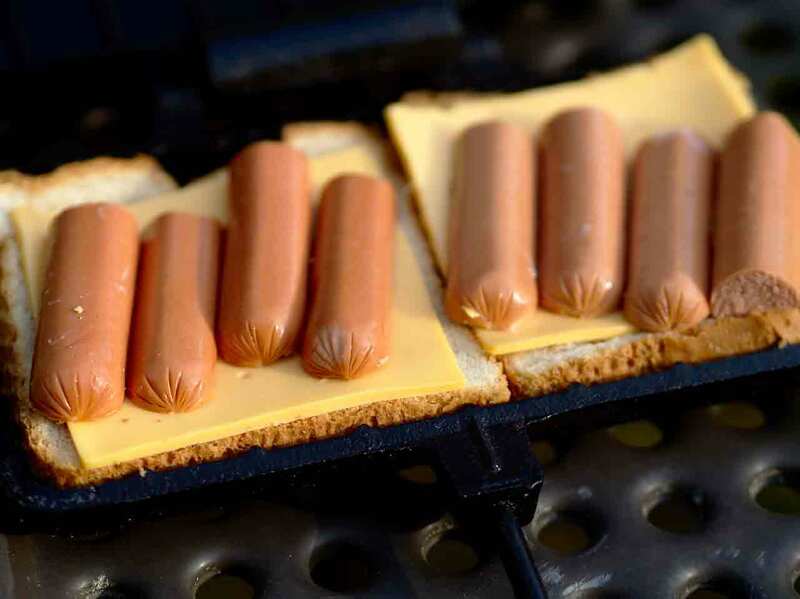 Combine your campfire grilled cheese with another campfire favorite: the hot dog. Roast your hot dog on a stick over the fire or fry it in the skillet first. (Feel free to skip this step if your hot dogs are fully cooked.) Slice them as desired and place them between two slices of cheese. Just as with the bacon sandwiches, get creative and experiment with spices, or just enjoy as is. Hot dog grilled cheeses are a home run with the under 10 crowd. Inspired by my favorite Swedish pizza toppings —which together are called an Africana pizza — the most unusual grilled cheese experiment was easily my favorite. I added chicken, banana slices and curry powder to my buttered bread and cheese. The tang of the curry blends perfectly with the sweetness of the banana for a very satisfying flavor combination. Don’t knock it ‘till you’ve tried it! We asked ourselves what we would do in the backcountry, if cast iron skillets and pie irons were too heavy to carry with us, and a loaf of bread was pretty impractical too. 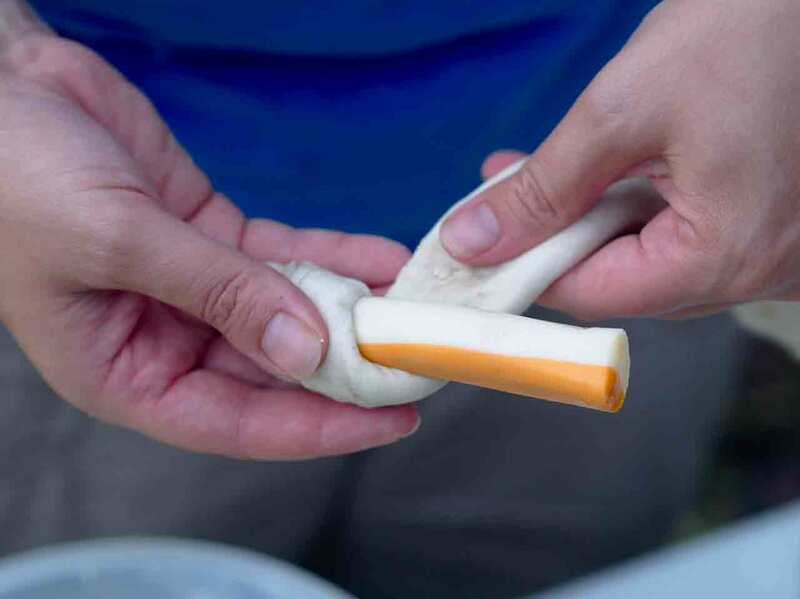 We took some string cheese sticks (ours were a swirl of mozzarella and cheddar) and wrapped them in campfire bread dough then roasted them on a stick like a hot dog or a marshmallow. They came out really well! Be sure to wrap the cheese stick completely in the dough without gaps. As the bread cooks, any gaps will widen and the melting cheese can get very messy or even start to burn. Directions: Mix dough well, kneading by hand. 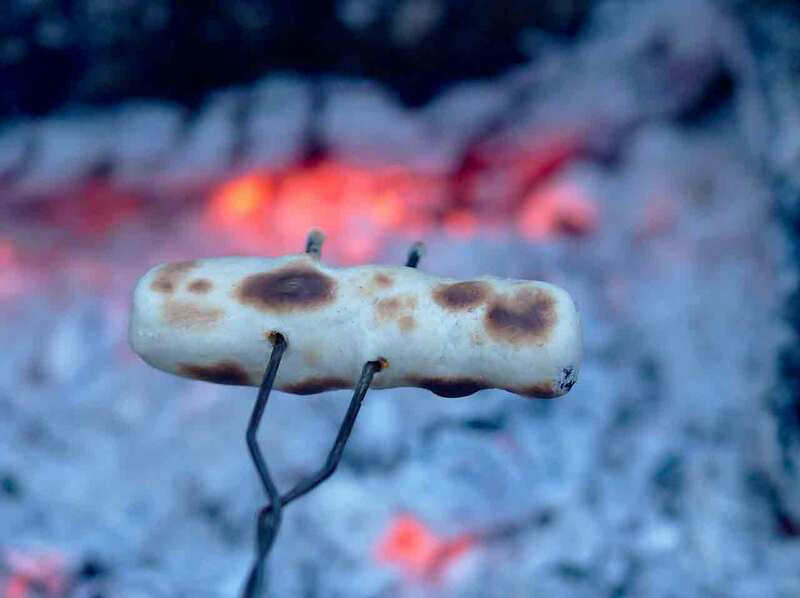 Wrap around a stick in thin layers and roast over hot coals for a few minutes. Dry ingredients can be pre-mixed, then just add water when you’re ready to cook! Butter: Salted butter can be kept at room temperature for up to about 2 weeks. 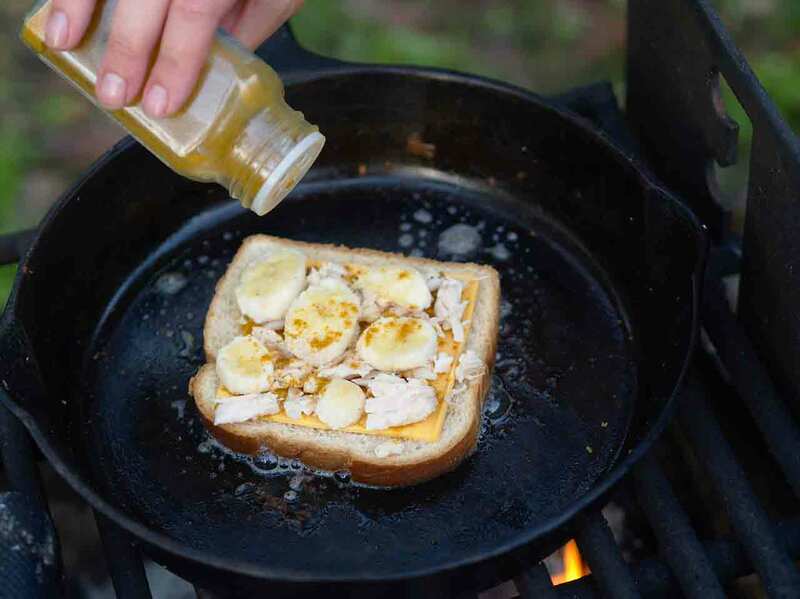 If you’re camping in extreme heat or would prefer not to chance it, your grilled cheese can still be great with olive oil. Cheese: We used slices of American cheese to make our sandwiches, but harder, aged cheeses can last much longer without refrigeration. Remember that cheese used to be a way to preserve milk before the invention of refrigerators. Cheddar and gouda are great examples that are delicious on sandwiches. Bacon: Pick up a package of shelf-stable bacon bits. Ranch dressing: Since this is a refrigerate-after-opening item, bring a small, unopened package. You could also try sprinkling dry Ranch dressing mix as a seasoning. Chicken: Canned chicken works great! It is extra salty, though, so adjust your other seasonings accordingly. Hot dogs: There is some debate about how long a regular package of hot dogs will last without refrigeration, but the official word from the USDA is 2 hours. We won’t judge if you wait longer, but if you want to be sure to be safe, use canned or jarred franks that are shelf-stable. 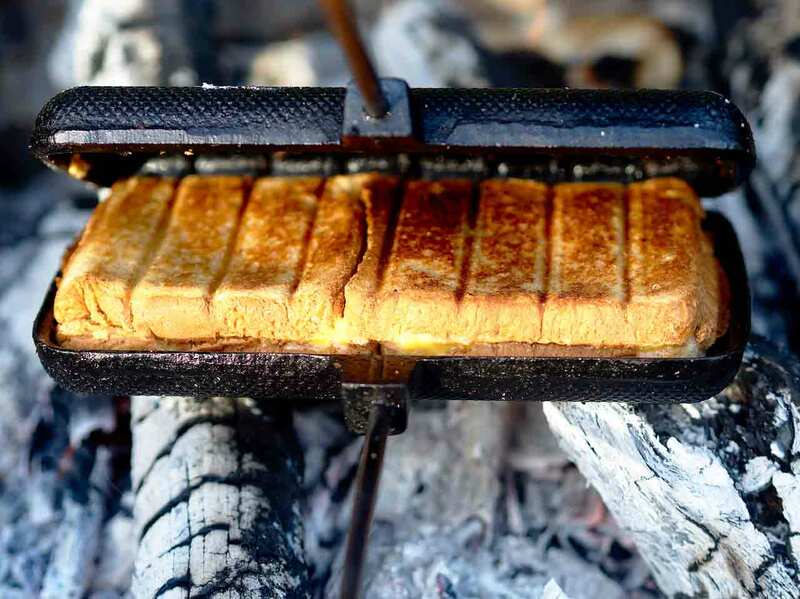 Campfire grilled cheese is the ultimate comfort food. Whether testing new flavor combinations or sticking with the simple, classic recipe, you can’t go wrong with this tasty sandwich cooked over hot coals. Celebrate Friday, celebrate spring, and celebrate the grilled cheese sandwich. 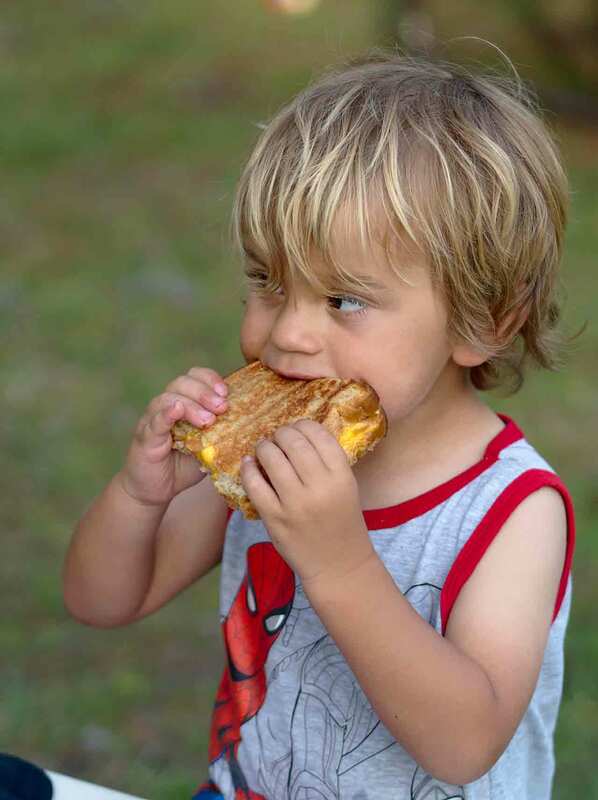 Happy National Grilled Cheese Sandwich Day! 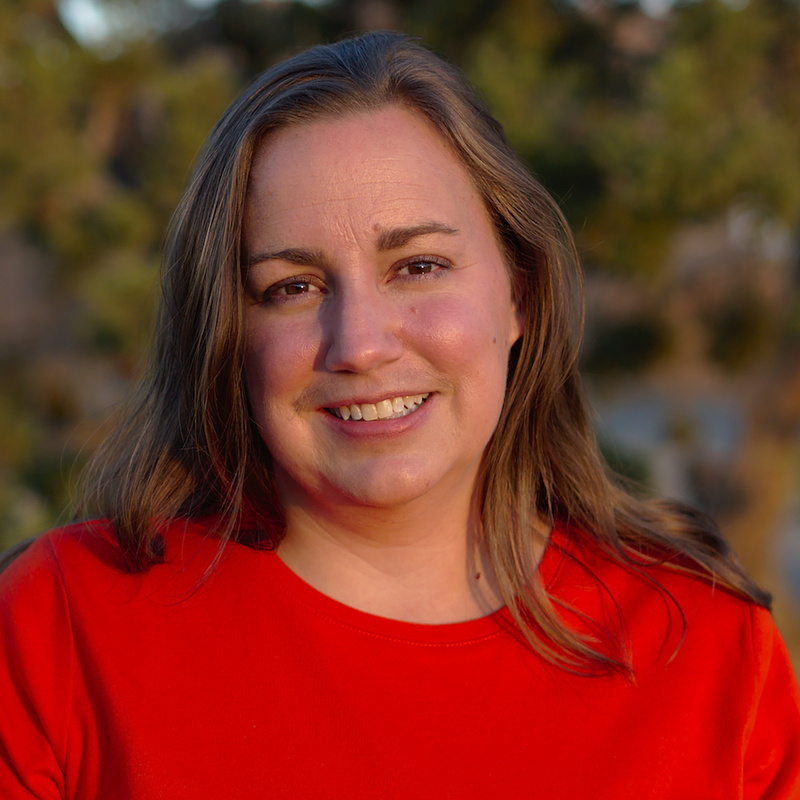 Christine Lindstrom is a writer, full-time RVer and a homeschooling mother of three. She blogs about simplicity, travel, and family life on the road.